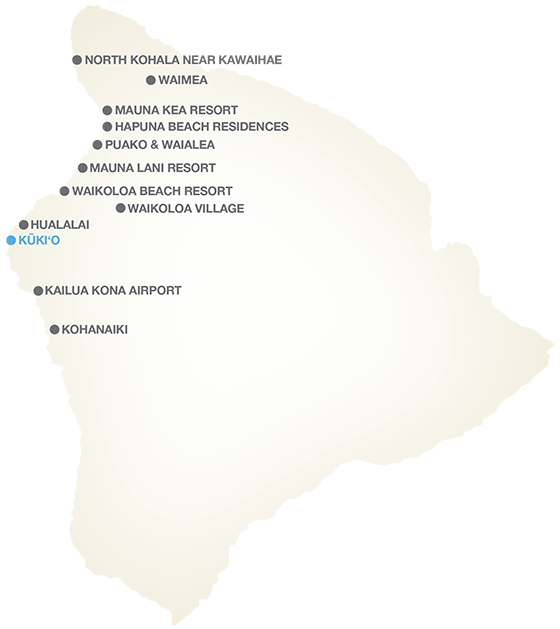 Kūki‘o is next to the Four Seasons Hualalai Resort and boasts one of the most pristine white beaches on the Big Island. Like Kohanaiki further south, this is a private equity beach and golf club, open to new members by invitation only. The Kūki‘o Golf and Beach Club encompasses two golf courses: an 18-hole championship course and a 10-hole short course, both designed by Tom Fazio. Members also enjoy exclusive use of the 13,000-square-foot Clubhouse, spa and ﬁtness facility, dining pavilion, and beach bar. The Outdoor Pursuits Ocean Sports Program is available to members who are interested in surfing, sailing, kayaking, paddleboarding, and other water sports. Homeowners looking for an exclusive, private resort community can choose from condo, hales, villas, and custom homesites. Prices range from $1.5 million to $35 million.